Cave > mural > graffiti > Street art > PR? Street Art is now trendy "hot", as every city races to decorate walls in their area. But painting on walls has been around before this, remember graffiti? That anti social behaviour of the disenfranchised and alienated young? Even before this all happened, look to Greece and Roman times, such as the colourful murals at Pompeii. Way before there were even walls, people painted in caves nearly 35,000 years ago. Much more recently I was employed by a high school to assist their talented art students design and paint a picture on a local bus stop shelter. It was funded by a local government as a way to hide and discourage the ugly graffiti that kept popping up there. Perhaps it was also a way to stop the same students tagging the bus stop? By altering their visual aesthetic, the new images were more acceptable to the general adult public. So street art was legal, taught in WA schools and sponsored by government, while graffiti art was illegal. Not surprising over time street art became dominated by TAFE and university art students and graduates. They used it as a way to get their art or message seem. As emerging artists it was always difficult to gain access to gallery system and their patrons. Eventually some were lucky and were invited to and paid to paint walls. If they had a large enough social following they were invited to exhibition in commercial and public galleries. Currently, street art has become associated with a degree of desperateness. Every local government in Western Australia (and elsewhere) is rushing to have every boring wall decorated. Preferably by some world famous street artist, or up and coming artists. This is becoming a huge "Public Relations Exercise" (PRE), as each government tries to make its area look more attractive as a place to visit, live, work and spend. A glut of new apartments and cafes, plus an economic downturn, motivates local business to pressure cities to "do something about it". Attract the public into their area, and into their empty apartments, warehouses, and shops may just help them survive. Perhaps this is all too cynical a perspective? ​Sometimes people just want something beautiful to look at. Years ago I was commissioned to paint a mural to beatify an ugly old garden shed, and created a tropical beach scene. The second commission, in May 2008, was totally different, and beauty was not a high priority: this was principally a result of deep frustration and ultimately an act of self expression by the client. 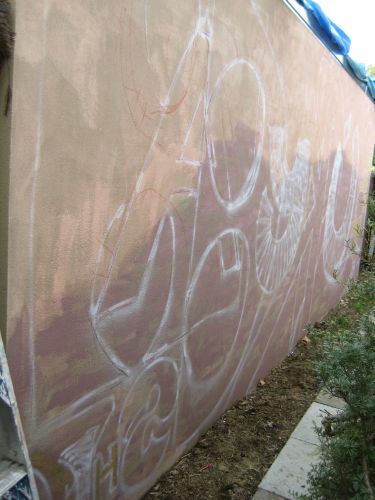 The Brief was for a mural on an offending parapet wall, created when a "macmansion" was built right up to the client's domestic property boundary. She wished to include provocative language about the neighbouring macmansion, on its parapet wall, as it blocked out the sun and airflow around her home. Permission was not sought, as the 3 metre high profanity was on private property, and out of view from the street. 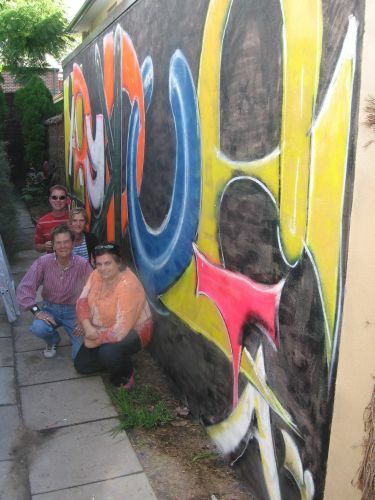 The client was inspired by the style of writing used in graffiti she saw on her daily walks around Subiaco with her dog. So I was invited on a walking tour of her favourite graffiti sites, which were predominately on empty blocks of land. Sadly most of these have now gone. Like a previous mural I had done, I designed and mapped out the plan on paper and then up on the wall. In this case I reversed the text and fonts, to make it much more interesting. We then collected old cans of paint and new cans of aerosol paint. Drinks were provided and so the client, her friends, and I spent an enjoyable afternoon colouring in the final work with brushes and aerosol cans. Perhaps this is why Street Art has now taken off-because it offers the client, friends, and sometimes the public an opportunity to participate? All this without having to be in a classroom or intimidating art gallery.? Community Art?